Corrosion-fatigue is the result of the combined action of an alternating or cycling stresses and a corrosive environment. The fatigue process is thought to cause rupture of the protective passive film, upon which corrosion is accelerated.If the metal is simultaneously exposed to a corrosive environment, the failure can take place at even lower loads and after shorter time. In a corrosive environment the stress level at which it could be assumed a material has infinite life is lowered or removed completely. 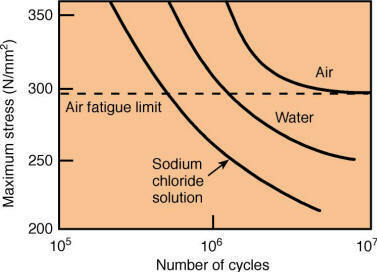 Contrary to a pure mechanical fatigue, there is no fatigue limit load in corrosion-assisted fatigue. 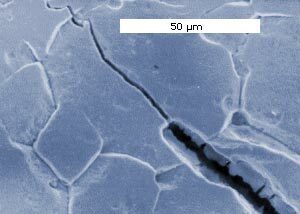 No metal is immune from some reduction of its resistance to cyclic stressing if the metal is in a corrosive environment. Control of corrosion fatigue can be accomplished by either lowering the cyclic stresses or by various corrosion control measures (see checklist). Limit corrosion factor in the corrosion-fatigue process (more resistant material / less corrosive environment).